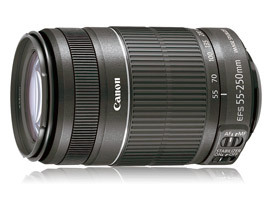 Covering such a versatile focal range with a relatively small and lightweight construction, budget telephoto zoom lenses such as the EF-S 55-250mm f/4-5.6 IS STM are never going to be the best performing optics available. 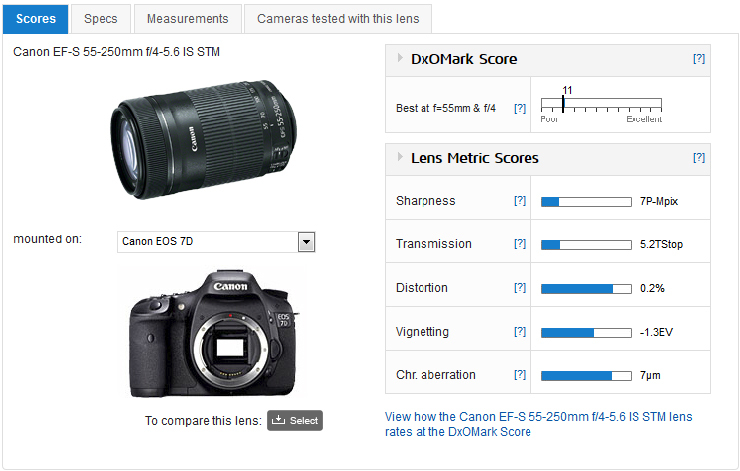 Tested on EOS 7D the EF-S 55-250mm f/4-5.6 IS STM achieves an overall DxOMark lens score of 11, which ranks it towards the lower end of the performance spectrum. 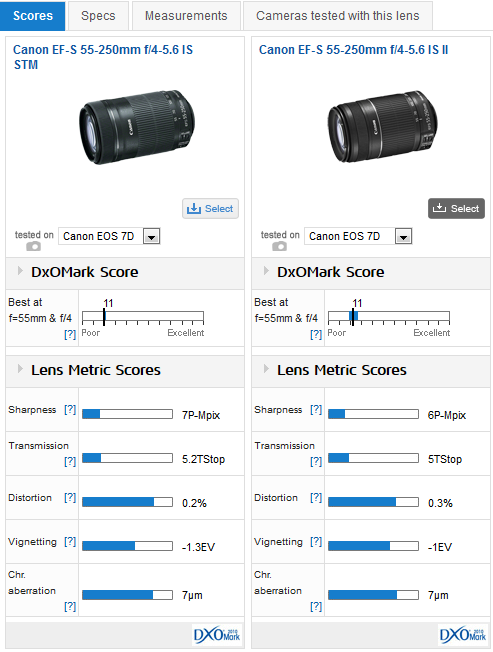 With better performance for Distortion, Vignetting and Chromatic Aberration the EF-S 55-250mm f/4-5.6 IS STM puts in a relatively poor performance for Sharpness and Transmission, which has affected its combined DxOMark score. The EF-S 55-250mm f/4-5.6 IS STM performs best at 55mm f/4, but for Sharpness the lens’s sweet spot is f/8 where it resolves the best sharpness at all focal lengths. 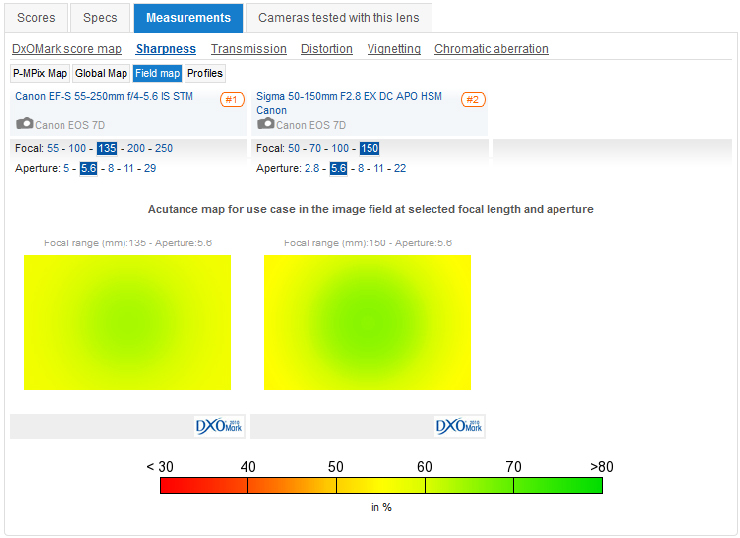 Resolution at the lens’s variable maximum aperture setting of f/4-5.6 is towards the better end of the scale too, but stop the aperture down between f/11 – f/32 and there’s a significant drop off in sharpness. If you’re only after a telephoto zoom lens like this for stills as opposed to video, then the addition of the STM stepping motor won’t really interest you. Bearing that in mind, it’s possible to pick up the older non-STM version a little cheaper at $249, compared to $299, and there’s no significant difference in image quality on the new lens. 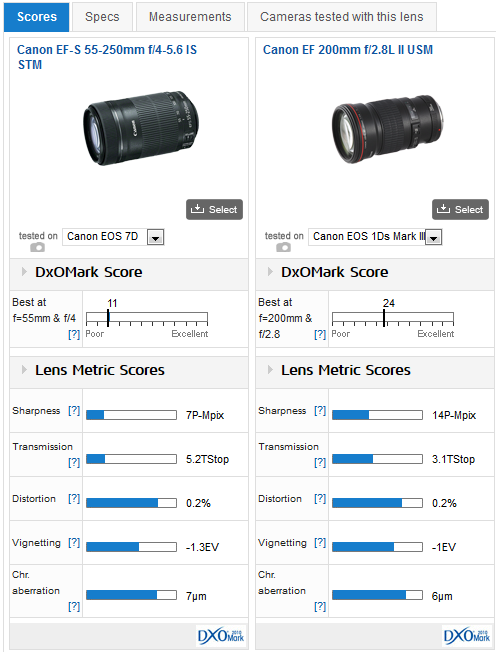 Both achieve a DxOMark Lens Score of 11 tested on the Canon EOS 7D and perform best at 55mm f/4, although the STM version is slightly sharper overall, scoring 7P-Mpix compared to 6P-Mpix for the original. If it’s predominantly for sports or action photography you’re considering this lens however, then the ‘slow’ variable maximum aperture of f/5.6 at 250mm is going to have an impact on its effectiveness. The 3.5 stops of image stabilisation will help when it comes to shooting relatively static subjects, allowing you to use slow shutter speeds of around 1/50th sec at 250mm and still prevent camera shake. But for action photography and shooting moving subjects you’re going to need pretty good light with this lens’s maximum f/5.6 aperture to get the shutter speeds required. An alternative to consider is the Sigma 50-150mm f/2.8 EX DC APO HSM lens, which, despite offering less range still provides a decent 80-240mm focal length and slightly better optical performance. 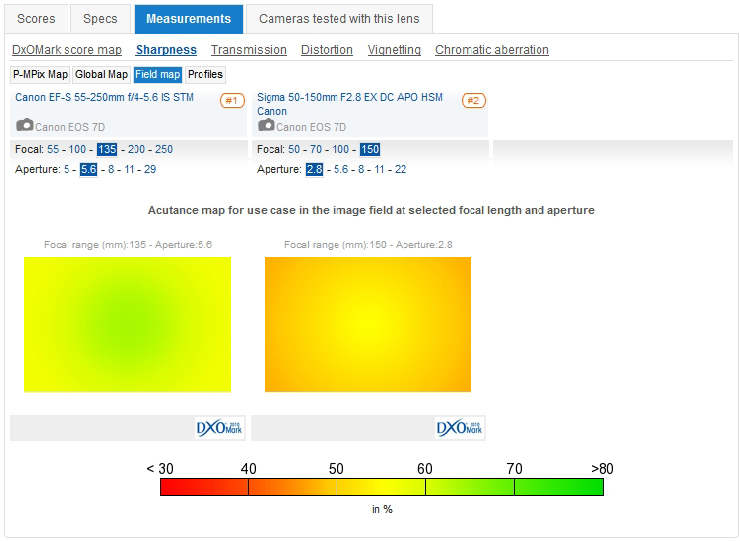 Crucially the Sigma also features a fixed f/2.8 maximum aperture, which lets in 4 times more light than the maximum f/5.6 aperture on the EF-S 55-250 f/4-5.6 IS STM. The ‘faster’ f/2.8 maximum aperture will not only significantly increase the size and weight of the lens, but also bumps up the price tag too with the Sigma 50-150mm f/2.8 EX DC APO HSM setting you back three times as much at $989. What you’re paying for is that fixed f/2.8 aperture, which, as we can see from its Lens Metric scores, significantly boosts the lens’s light Transmission. 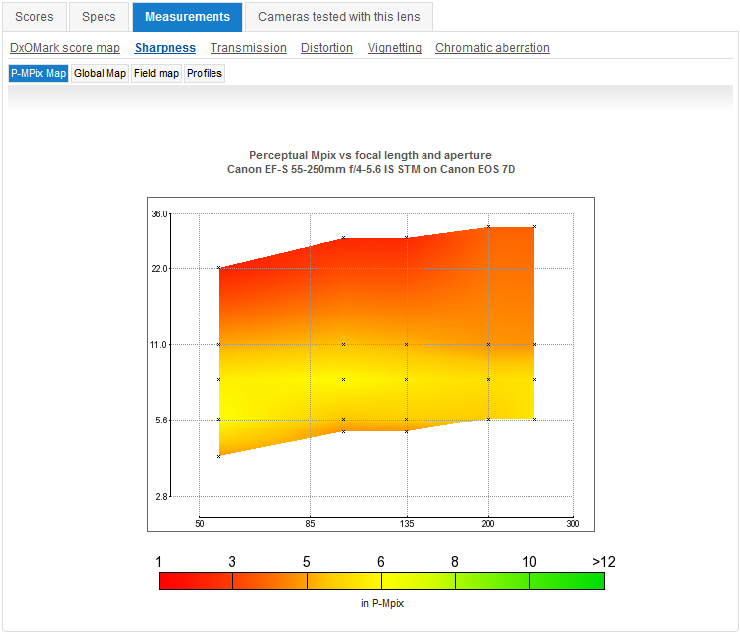 Improved Transmission will improve the cameras autofocus performance, as well as facilitate a brighter image in the viewfinder, both of which are beneficial for action photography. The Sigma option isn’t significantly better in terms of the other lens metrics however and at 150mm f/5.6 the Sigma 50-150mm is only marginally sharper towards the centre of the frame with similar levels of drop off at the edges as the cheaper Canon alternative. Opening the aperture to f/2.8 is the advantage of the more expensive Sigma lens enabling faster shutter speeds for action photography although it is not the sharpest at 150mm f/2.8. If you’re after a telephoto lens predominantly for action shots using fast shutter speeds and want good levels of sharpness a telephoto prime is a better option. The $779 Canon EF 200mm f/2.8L II is designed for full frame cameras but works with APS-C sensors too, where it offers an equivalent 320mm focal length. There’s no image stabilisation available but that ‘fast’ f/2.8 maximum aperture lets in 4 times more light than f/5.6 on 55-250mm, which is more useful than image stabilisation when it comes to action photography. Achieving a DxOMark Lens Score of 18, compared to 11 for the EF-S 55-250mm f/4-5.6 IS STM, the 200mm f/2.8L II USM prime offers better scores in all sub categories. At $779 it will set you back significantly more than the cheaper 55-250mm and comes in a heavier and bulkier build, but produces much better results at 200mm, offering more homogenous sharpness and the ability to create more attractive shallow depth-of-field effects, too.